dgVoodoo 2 is a great wrapper for old graphic APIs. It can render MM7 and MM8 in high resolution mode. 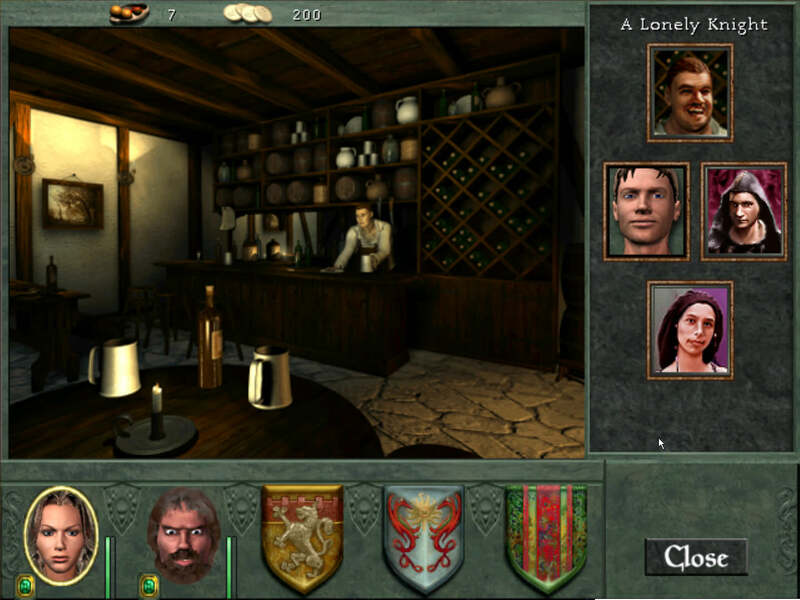 With the tool, the 3D scene is in high resolution and the 2D interface is resized proportionally. It also works for Rodril's MM678 merge, since the merge is based on MM8's engine. Which means, we now have MM6 in high definition hardware 3D mode through the MM678 merge and dgVoodoo 2. 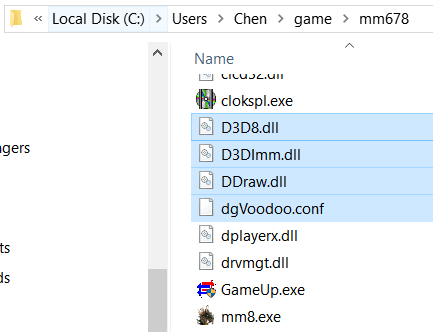 Extract the three files (DDraw.dll, D3DImm.dll, D3D8.dll) in the \MS\ folder directly to the game folder, Extract dgVoodooCpl.exe to any place you like. 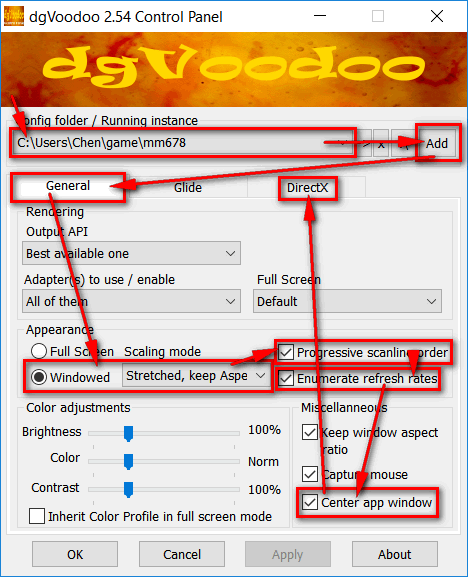 Run dgVoodooCpl.exe and configure as the screenshots show. You also need to "auto-hide" your windows taskbar. Find your screen resolution, for example, 1920 x 1080. 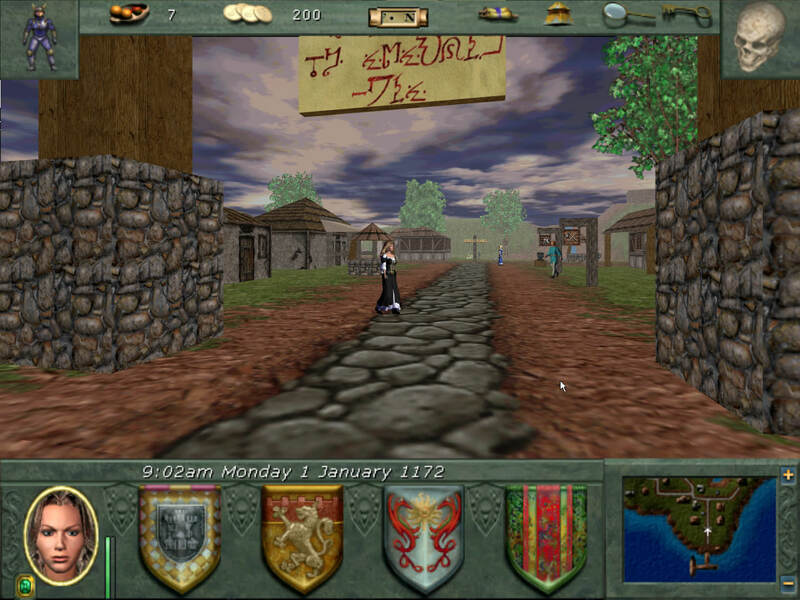 MM6-8 game runs in a 4:3 window, and 1080 / 3 * 4 = 1440, so in the full-screen mode, your game should run in a resolution of "1440 x 1080"
After clicking "Ok" or "Apply", a dgVoodoo.conf file will be generated in the game folder. Run MM8Setup.Exe (or MM7Setup.Exe) in the game folder, make sure the settings are the same as the screenshot shows, then launch the game. [Mouselook users only] If the graphics is not properly rendered (color issue) or the cursor disappears, you may need to toggle full-screen and window mode with "F4" key for several times, until everything is fine in the full-screen mode. 1. Go to NVIDIA control panel, then go to "Adjust desktop size and position"
Apply that, now you have a virtual 1440 x 1080 monitor. 4. Check "Application controlled fullscreen.."
5. Check "Disable alt-enter to..."
Now you can play MM in 1440 x 1080 (fullscreen) perfectly without being blocked by the taskbar, and glitchfree! And no longer need to press F4! To see a full-size image, please right click the image -> click "open image in new tab"/"view image", or drag the image to a new tab. 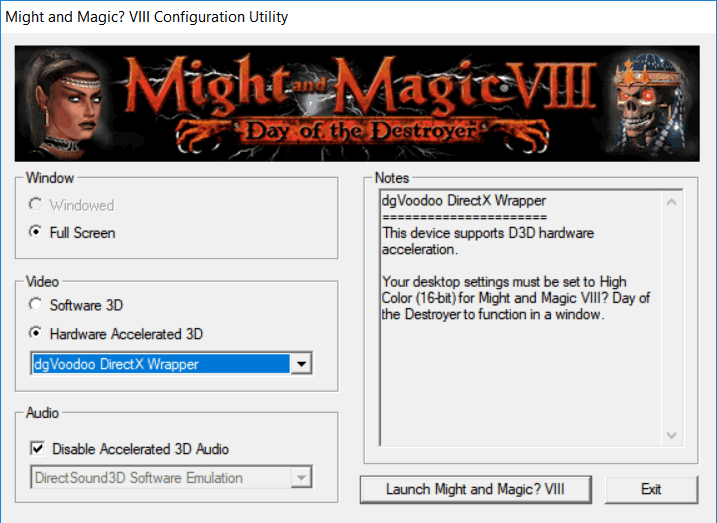 It also works for original MM6, but since MM6 doesn't have hardware 3D mode, dgVoodoo 2 can only resize the window and cannot make the resolution higher. You can use other better window resize tools such as DXWnd and D3Dwindower to achieve the same thing. MMResTool (aka. 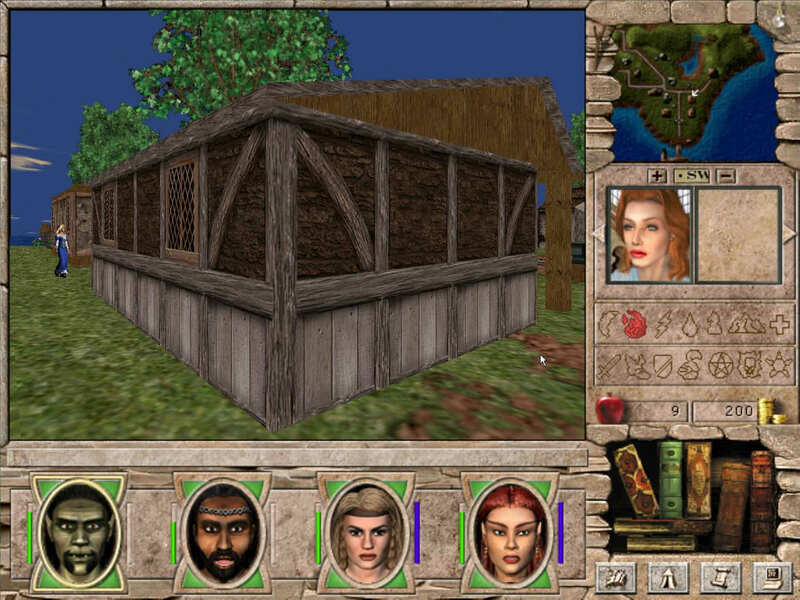 mmtool), Might & Magic Compatibility Layer (by Emjayen) are great. But as a general tool that is not specifically designed for any game, dgVoodoo 2 works almost perfectly and better than the other tools (MMResTool doesn't show Smacker animation and MM Compatibility Layer is in alpha stage and unstable), that's amazing. Last edited by tomchen1989 on May 7 2018, 13:56, edited 11 times in total. I've updated the "Usage" section in the original post, making compatibility with Grayface mouselook possible. Please do as the updated "General tab settings" screenshot shows, and the "FOR MOUSELOOK USERS ONLY" section says. You will need to auto-hide taskbar, which might be a little disturbing. You might encounter some graphics rendering issues that you need to toggle full-screen and window mode with "F4" key for several times to solve (see "Problem solving" section). Apart from these, normally it should work fine. Well since the tool wraps it into DX9 or 11 could it mean that we can have post effects now? Reshade/ENB or anything. Last edited by Vinevi on Jan 11 2018, 17:21, edited 4 times in total. Looks swell! Definitely going to use it next time I play the game! Thank you! 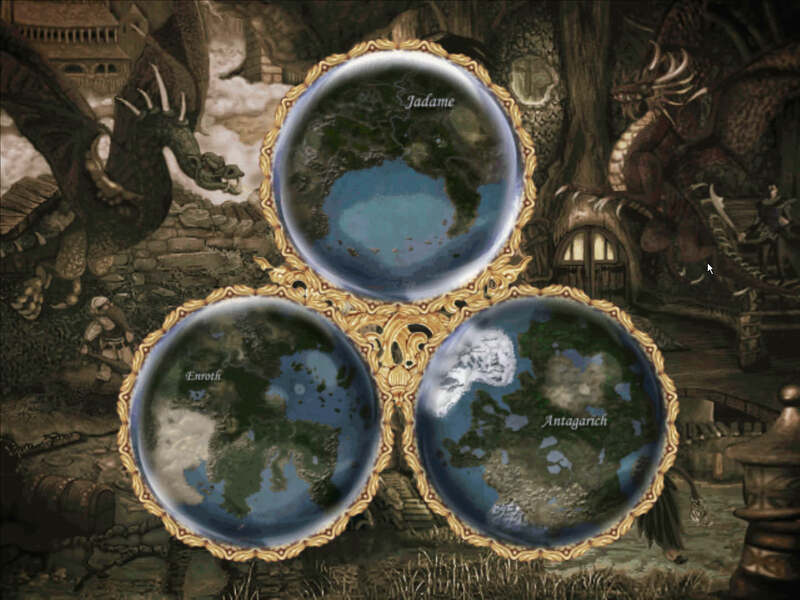 Might & Magic with ENB? :O Do I want to see that, oh my! It seems to be working fine, really enjoying the shiny new graphics so far. Thanks again Tomchen! 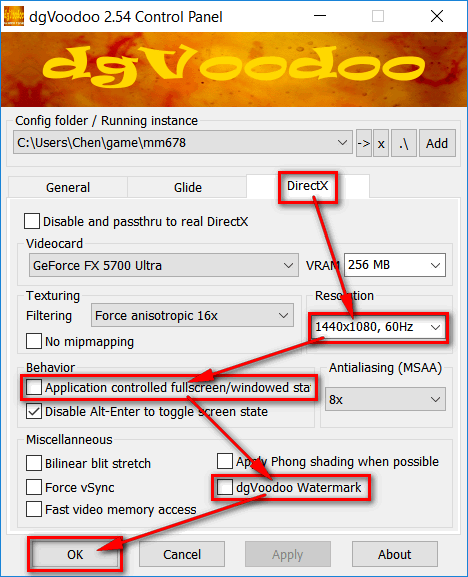 OK, running Windows10x64, version 1709, build 17063, DGVoodoo2.54 is working perfectly with the merged game when configured as you have so thoughtfully illustrated it here! I am using it with the Mouselook option which is working fine, btw @2560x1440 x60Hz (Max/native). What I've noticed is that I kind of have to "coax" the mouse in order for the cursor to appear in a static frame every once in awhile--as if the DGVoodoo "capture mouse" setting isn't working so well, possibly. But, the mouse cursor will *always* appear--it's just not predictable--have to move the mouse around until I see the cursor appear and *then* it will work as expected in the scene frame. With mouselook invoked in the main game display window, it works fine--it's only when in a static screen that I have to coax the mouse to get the cursor to appear. I tried some variations--for instance--selecting "full screen" in DGVoodoo2.54 instead of Windowed--and guess what--no more skittish mouse cursor--it's always there, always working as it should be--until--you guessed it... ...I try mouselook in the main display window--and then it is spinning endlessly time again which won't stop until I exit mouselook. So that won't work. Wondered if you maybe knew of a setting I could try to get a more stable mouse cursor in static frames while invoking the mouselook option. If I haven't supplied enough info here let me know and I will, gladly... Thanks! Edit: Mouselook seems to be working fine, actually--along with the mouse. Updated: Still running right as rain under Win10x64, 1709, build 10783! Can no longer envision playing these games without DGVoodoo2.54. Last edited by waltc on Jan 31 2018, 17:47, edited 2 times in total. Last edited by waltc on Jan 10 2018, 22:00, edited 2 times in total. hi guys, I play on a convertible windows tablet and often use the touch screen directly instead of the mouse pad. but with voodoo plugin the touchscreen don't react anymore... Is there a solution? Is there a way to make touchscreen working with voodoo plugin or at least to make the window as big as possible (1440x1080)? Last edited by equs on Jan 11 2018, 15:10, edited 3 times in total. Bad news for Windows10x64, 1709, build 17101...installed today. It breaks Sergey's 2.0 Mouselook patch for MM8. No settings at all in dgvoodoo2.54 serve to restore--been trying different combinations for the past hour--nothing works. Everything in the game works without a problem--except Mouselook. Hard to say but I think at this point it's likely due to a bug in this beta version of Win10--although the version I am testing for Microsoft now is the first in the short string of bug-fixed releases before the official RS4 release of Win10 is released in a couple of months. I still have a couple more tricks to try--if something changes I will report it here. Hello, I've added MouseLook support into MM678 for this case, details in first post there. Good point about solution is, it does not require any tweaks in dgVoodoo, so i'm posting stand alone version, which require patch and MMExtension 2.1 or newer, works only for MM8, might be useful until original MouseLook issue is solved. Rodril wrote: Hello, I've added MouseLook support into MM678 for this case, details in first post there. Good point about solution is, it does not require any tweaks in dgVoodoo, so i'm posting stand alone version, which require patch and MMExtension 2.1 or newer, works only for MM8, might be useful until original MouseLook issue is solved. Last edited by waltc on Mar 5 2018, 0:12, edited 1 time in total. I am surprised about this but I thought you'd like to know...! Installed Win10x64 build 17115.1000 (version 1803) a few minutes ago...and guess what?...darned if they haven't already fixed the bug...! 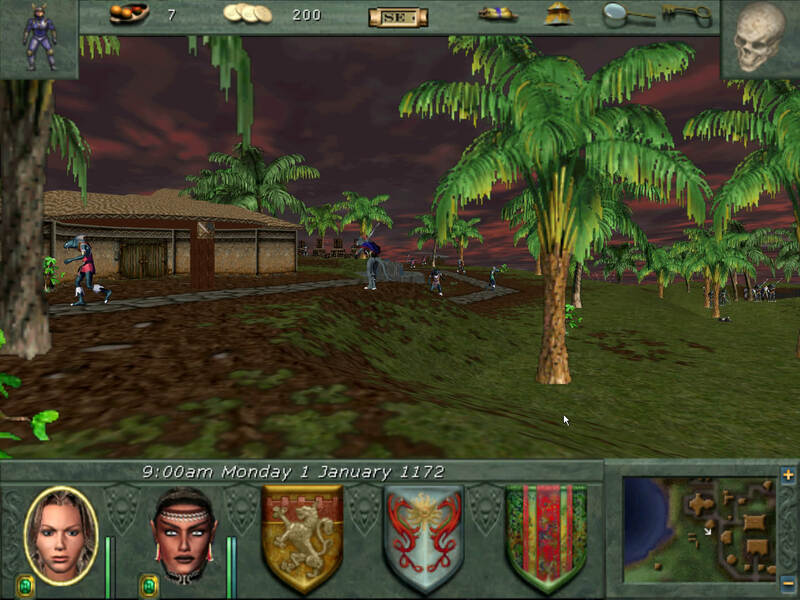 Yep I just ran my test version which is a straight install of GOG's MM7, along with Sergey's 2.0 patch--and Mouselook via the capslock key is working again... Ha-ha--so it goes it with Microsoft--sometimes it takes a while, sometimes it doesn't...! But I am definitely holding on to your very nice Mouselook remedy--in case this happens again. They are in the final bug-fixing stages now until the official spring release of RS4--so who knows what can happen--they may yet trip that bug before then, again...! Thanks again, Rodril! Should I encounter anything else relative to the Mouselook subject I'll be sure and let you know. I can get "high res" but not better looking graphics. 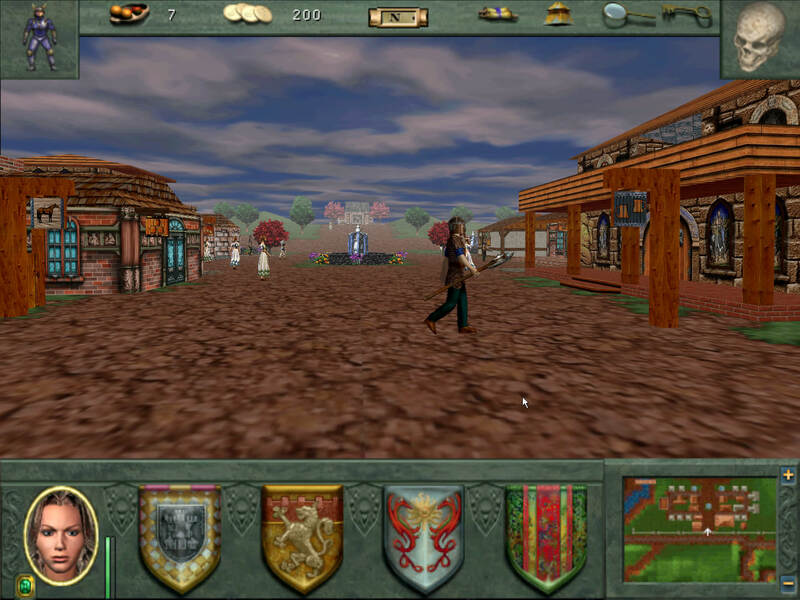 It looks the same as the original game, bulky. The pictures further up in thread is what I wanted. I followed exactly but can never get it to work.